Going back to when he became a starter in 2015, Kirk Cousins has had 41 passes deflected, which gives the Vikings something to "fix and correct" as the season goes forward. Though he still completed 70.5 percent of his passes on Sunday, Kirk Cousins’ day against the Cardinals — during which he went 24 of 34 for 233 yards, a touchdown and an interception — was his second-worst of the season from both a passer rating and completion percentage standpoint. On Sunday, more often than not, there was an odd culprit: a Cardinals defensive front that found some success batting down Cousins’ pass attempts. 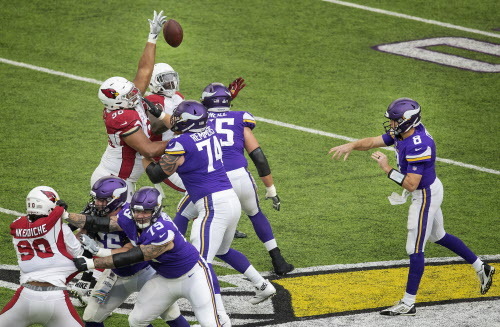 The Cardinals batted five of Cousins’ passes at the line of scrimmage on Sunday, with a sixth falling to the quarterback, who lost two yards after catching the deflection. The batted passes accounted for five of of Cousins’ 10 incompletions on Sunday, with a spike also in the tally. In other words, when Cousins got his passes beyond the line of scrimmage, he completed 23 of his 27 attempts, with one interception and two incomplete passes. His impressive accuracy the rest of the day made the batted passes even more noteworthy, especially given the fact Cousins was tied for third in the league before Sunday with six batted passes, according to Pro Football Focus. He had seven throws batted down during his first year as a starter in 2015, and 10 in 2016. Last year, Cousins’ 11 batted passes tied him for fifth in the NFL; he’s already matched that mark in 2018, and is tied for the league lead. So what went into the batted passes on Sunday? The batted passes are worth keeping an eye on going forward, especially given when some of them occurred. Benson Mayowa’s two batted throws stalled the Vikings’ first drive of the game, and Chandler Jones batted a pass on a 3rd-and-5 in the third quarter. –If Mike Hughes is indeed out for the season with a torn ACL, as the Vikings feared after Sunday’s game, they’ll have to improvise in the secondary, possibly by employing some of their safety depth as they did Sunday. George Iloka started next to Harrison Smith with Andrew Sendejo out because of a groin injury, but Jayron Kearse got in for five snaps as part of the Vikings’ big nickel package, and Anthony Harris saw 15 snaps on defense, intercepting Rosen late in the third quarter. The Vikings used Mackensie Alexander for 33 of their 58 defensive snaps, and the nickel corner registered a sack off a blitz and an end zone pass breakup on Larry Fitzgerald. The Vikings will have to lean heavily on the third-year corner going forward, and could work in players like Iloka, Kearse and Harris once Sendejo returns. –After going 3-for-4 for 117 yards on passes of 20 yards or more against the Eagles, Cousins stuck to a diet of shorter throws on Sunday. According to NFL Next Gen Stats, Cousins’ longest throw of the day covered 16 air yards, and he attempted only five of 10 yards or more. The Cardinals had Patrick Peterson shadowing Stefon Diggs for parts of the game, and the receiver caught only three passes for 33 yards. Cousins reacted by targeting Adam Thielen on 15 of his 33 passes (excluding his one spike). No other Vikings receiver had more than four targets on Sunday.